Planning a Super Bowl Party? Come to Ed’s Tavern! Written by Ed's Tavern on January 28, 2019 . Posted in Blog, Events, Sports. Planning a Super Bowl party? Come to Ed’s Tavern! 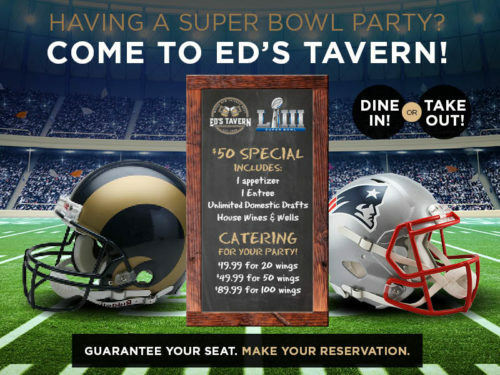 Take the stress out of planning for the Super Bowl and simply enjoy the game by allowing Ed’s Tavern to take care of the catering and/or the location. At Ed’s Tavern, we are welcoming guests to our location, and also providing a catering menu to people celebrating at home. Learn more about both options by reading on. If you’re having a Super Bowl party at your place, but want Ed’s Tavern to cater, we can provide you with party-sized servings of wings. Order 20 wings for $19.99, 50 wings for $49.99, or 100 wings for $89.99. No matter how big or small your Super Bowl party is, we have a serving size that is ideal for your guests. Make sure to reserve your seat at Ed’s Tavern in Lakewood Ranch today! You don’t want to miss out on our Super Bowl specials this February 3. Make this Super Bowl Sunday one to remember by reaching out to us at 941-906-0400 to claim your seat or to request your catering meal. We hope you will join us for Super Bowl Sunday and can’t wait to celebrate the big game!